He could have balked. He could have thrown up his hands and fled to places unknown. Instead, he put on his big boy pants and took each day as it came in the only way he knew how. And he did a marvelous job. I am not sure I could have done what my father did. Like most caregivers, he devoted the last few years of his life to care for my mother, who was diagnosed with Alzheimer’s on her 70th birthday. We lost her in December 2011, eight years after the diagnosis. During that span of time, I watched my father assume the many tasks – cooking, cleaning, even changing the beds! -- that my mother had covered throughout the first 50-plus years of their marriage. I watched my father grow more patient and I watched him attempt to cope with the ever-changing demands that Alzheimer’s disease had interjected into their lives. Yet, as any caregiver knows, caring for a person with Alzheimer’s disease is best accomplished with support. The broader the network, the better. Living barely three miles from my parents, I was able to assume the role of back-up. I could bring a moment of joy to both parents – and myself – by taking my mother out for the drives she so loved. While Dad napped or just shut down the “always on” part of a caregiver’s brain, Mom and I would cruise local byways. Rarely did we skip a chance to drive by the river, where she – a passionate fisherwoman -- had cast so many a line. Typically, we’d wrap up our tour at the local burger joint, where we’d giggle like school girls as we watched our baby-sized ice cream cones dribble into our hands. My father demanded so little of me. But I called him – still call him – at least twice a day. The calls gave him a chance to vent, to report on the most recent of my mother’s Alzheimer’s-fueled shenanigans. It gave him a chance to converse with someone – by then my mother was virtually non-verbal – who would listen and respond. 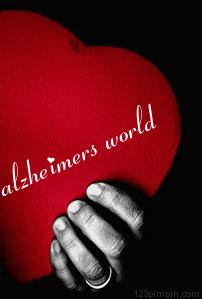 Meanwhile, day after day, as I breezed through my email, I poured over articles from the Alzheimer’s Reading Room. So many of them hit home, boy did they hit home. I’d print them up, highlight the key points with a yellow marker, and deliver them to my computer-challenged father. He collected the articles – which ranged in topic from how to deal with wandering to potential cures on the horizon – in a large binder I had given him. When that binder overflowed, I gave him another. I asked him several times if I had maxed out his “in box.” But, no, he didn’t want me to stop. He appreciated the suggestions and advice. The articles served as constant reminders that he was not alone in his struggle. For that same purpose, I urged him to attend the local Alzheimer’s support group. Like just about anything new I proposed, the doing required subtle persuasion, gentle persistence and plenty of patience. That’s exactly how I, with support from my out-of-town siblings, convinced him to stay ahead of the curve. Over time, I learned that if he wouldn’t listen to me, he might accept the very same advice if suggested by my brother. As a last resort, I knew he’d take his doctor’s word as gospel. That’s how we sold him on in-home help and that’s how I coerced him into attending support group. My father would later admit the rewards were well worth the efforts. Yes, it took much prodding and phone calls on my part, but he eventually found two caregivers that he “adopted” as daughters. Though he rarely left the house, he finally could. Even when he stayed home, even if mom were napping and needed no assistance, the caregivers’ presence proved invaluable. They eased my father’s life by assuming the responsibilities that he otherwise shouldered 24/7. Likewise, my father came to look forward to monthly support group. After a few sessions, he not only felt comfortable attending alone (if I was unable to join him) but he took pride in discovering he – the “untrained caregiver” – had tips he could share with his peers. During my mother’s final year, our support system broadened. As the caregivers’ hours increased, so did my phone calls and visits. Meanwhile, my brothers kept touch via Skype and long distance. As for my sister, she would sweep into town on a semi-regular basis, move in with Mom and Dad and take charge in a way that brought everyone a sigh of relief. Change was the last thing my father was seeking when my mother was diagnosed with Alzheimer’s disease. He was nearly 80 years old. I’m not sure he’s yet fully grasped the altered world my mother had entered – can any of us? -- but he did his best to adapt. In his mind, he had little choice. But that’s only in his mind. Linda Halstead-Acharya, a former reporter for the Billings Gazette in Billings, Montana, is now a freelance writer working on a book about her experience with Alzheimer's disease. Before losing her mother to advanced Alzheimer's disease in December 2011, she provided support for her father, her mother's prime caregiver.